Andorra is a small principality of just 181 square miles having as neighbors France and Spain and it minted in 2012 a coin just as small, the Andorra Eagle 2 Diners Gold. This gold coin weighs exactly one gram of pure gold therefore it has 99.99% fineness and a diameter of 13.92 mm and a 0.6 mm thickness. The weight expressed in troy ounces will be the equivalent of 0.03215 troy ounces. 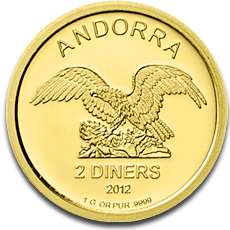 The Andorra Eagle 2 Diners Gold coin minted in 2012 represents just the second edition of the tiny coin with the face value of 2 diners. Other denominations in which it is available this coin manufactured from pure gold are: 100, 50, 25, 10, and 5 diners. These latter enumerated denominations, bearing the name of the animal depicted on them, have been minted starting with 2009. This coin belonging to the Principality of Andorra has the status of legal tender so it can be used for circulation as a legal method of payment. However, the official currency of this small country is the Euro and the diner is known as an artificial currency. As a consequence, the Andorra Eagle 2 Diners Gold coin was and is minted to have the function of commemorative coin for collectors and as bullion gold coin for investors. The reverse of the Andorra Eagle 2 Diners Gold coin is divided into quadrants. Two of these quadrants present three vertical lines respectively four vertical lines, also known as the paly of seven. The one found in the upper left of the Andorran coin depicts the image of the bishop miter. The last one illustrates two belled cows. The obverse of the Andorra Eagle 2 Diners Gold coin depicts the animal which gives the name of this coin, an eagle that has its wings spread while perching on a rock. The eagle is accompanied at the top of the coin by the inscription ANDORRA and at the bottom of the coin there is inscribed the denomination of 2 DINERS, the year of minting 2012, and the 1 G OR PUR .9999 inscription. The Andorra Eagle 2 Diners Gold minted in 2012 can be a popular investment thanks to its high purity of 99.99% pure gold. By investing in this gold coin, individuals will become the possessors of exactly one gram of pure gold. The difference is that it will be a gram of gold in the beautiful shape of a coin. This fact makes it to be an affordable gold coin so it can be bought in considerable quantity. The attraction from the part of collectors for the Andorra Eagle 2 Diners Gold is that it is the first bullion coin manufactured to weight exactly one gram to which it is added the fact of being a new coin on the market, minted for just two years until now. The Andorra Eagle 2 Diners Gold coin is available on our website, being a profitable investment, priced in accordance with the gold spot price, and free of VAT.